If your problem with The Nutcracker, either the original story by E. T. A. Hoffmann, or the Tchaikovsky-composed ballet, or the dozens upon dozens of screen adaptations of both, was that it wasn’t enough like Tim Burton’s Alice in Wonderland, then don’t worry because Disney has got you covered. 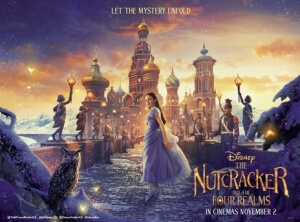 A strange mix of Burton’s financially successful (but critically far less so) film and just about every other live-action Disney remake so far, The Nutcracker and the Four Realms is a visually stunning but overall uninteresting fantasy adventure that young children will undoubtedly enjoy up to a point, but for adults it’ll be a far less rewarding experience. Taking place on Christmas Eve in 1800s London, young Clara (Mackenzie Foy) and her family are in mourning over the death of their mother Marie (Anna Madeley), because it’s not a Disney film unless at least one parent is dead before the story begins. She is given a mysterious egg-shaped contraption as a Christmas gift from her late mother, only it is locked and without a key in sight; it is not until she attends the Christmas party of her godfather Drosselmeyer (Morgan Freeman, wistfully cashing in his latest paycheque in a role that requires very little of him) that she finds herself wandering into a strange parallel world, populated by whimsical characters such as the Sugar Plum Fairy (a squeaky-voiced Keira Knightley) and a Nutcracker soldier by the name of Captain Philip Hoffman (Jayden Fowora-Knight), in search of the key, which has been taken by a gang of mice. Clara learns that the key is, erm, key to winning a war against Mother Ginger (Helen Mirren), who seems to have plans to use it for her own purposes, and only Clara, deemed Princess of the Four Realms after her mother is revealed to have been Queen once upon a time, can put a stop to everything. The comparisons to Tim Burton’s Alice in Wonderland are so great, from the attempts to inject more action and logic in a world that doesn’t need any of it, to the heavy use of CGI that make it more of a cartoon than some of the animated movies based on The Nutcracker, that they bring up more bad memories of that film than any good ones of this film. However, I will say that I honestly did kind of enjoy this a little bit more than Burton’s film, if only because it didn’t do some of the clichéd plot lines such as the prophesised saviour coming in to save everyone, not to mention the fact that the lead character and Mackenzie Foy’s performance was likeable enough to actually carry me through a lot of it, which is more than I can say about Alice in Wonderland which was never really good in the first place. That being said, this film did feel like as much of a studio product as Burton’s movie, coated in sugary dialogue and pretty imagery that is certainly stunning, especially a mid-way ballet sequence performed by prima donna Misty Copeland, but feels very hollow with the kind of soullessness you would find in an actual Nutcracker soldier. Unless you’re a girl under the age of 8, who this film was undeniably made for, you will be able to see some of the plot twists coming a mile away, which despite being less than two hours makes it feel a lot longer to sit through whilst you’re waiting for the characters to catch up with you. In the meantime, there’s very little attempts at sincerity that don’t feel so artificial, and you’re left with a movie that’s not necessarily awful but not worth much of your time either. The movie went through a slight production hiccup, with director Joe Johnston being brought on board when original director Lasse Hallström was unavailable for a month’s worth of Tom McCarthy-scripted reshoots (both filmmakers ended up sharing the director’s credit), but the film doesn’t necessarily feel like two opposing visions competing with each other, with the tone being somewhat consistent throughout and with whatever reshoots took place blending in seamlessly with what was shot before. In both directors’ cases, they have made something that at the very least looks wonderful; it’s a very colourful film, from the bubbly costumes to the CG-constructed sets to Linus Sandgren’s exquisite cinematography, and what few original ideas it has – specifically, the design of the Mouse King – are very interesting and rather creative. However, once again, both directors as well as the majority of the cast are working from a script that adds nothing substantial to the classic story, instead settling for something much more cookie-cutter and, for lack of a better word, Disney-fied; even the much-hated The Nutcracker in 3D, which controversially contained imagery reminiscent of Nazi Germany and the Holocaust, at least did something to make itself stand out, even if it was thoroughly misguided in its execution, whereas this is just a slideshow of some very pretty CGI used as a backdrop against a story you’ve seen many times before, whether or not it comes from The Nutcracker. Though this movie isn’t really very good, it’s not a completely terrible one; it’s mostly just dull, with one or two bright spots such as the wonderful visuals and Mackenzie Foy’s bright and wide-eyed lead performance, but other than that not much else going for it. I don’t entirely know how it stacks up next to the original story or the ballet, but I’d be willing to be there’ll be fans of both who will be up in arms about the changes they undoubtedly made in this movie, much like how fans of Lewis Carroll’s original Alice in Wonderland story got angry with how Tim Burton screwed that one up – though luckily, there’s no Johnny Depp around to do the Futterwacken here, which instantly makes The Nutcracker and the Four Realms at the very least better than that. The Nutcracker and the Four Realms is a beautiful-looking and harmless but mostly dull fantasy adventure that young audiences will be enchanted by, but adults less so with its hollow writing and overuse of effects that unfavourably call back to Tim Burton’s Alice in Wonderland, which this movie is (only slightly) better than.